Available now for only $25! New! Ritmo 1.1.1 is now available! - See all changes in version 1.1.1 Check out the forum for Ritmo users! The demo track was constructed entirely in Logic Audio, with all percussion done solely using Ritmo. The only effect applied to the drums is compression. The delay is Ritmo's built-in tempo-synced delay. This great demo composed by Claire Fitch combines Ritmo with excellent Cello playing. Ritmo is designed for every day percussion use. 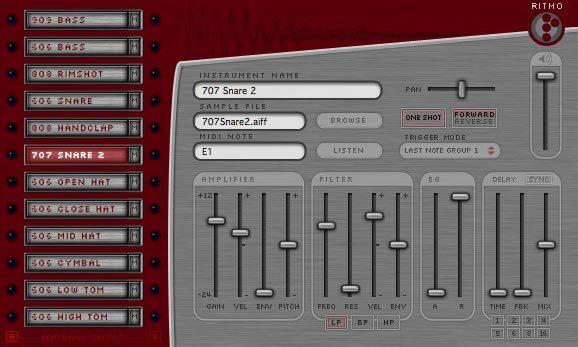 It has the features most useful for drum sample playback, while giving you enough features and flexibility to bring your samples to life. At the same time, the interface is kept clean, uncluttered, and easy to use. Because Ritmo is specifically for percussion, the sound of each instrument, like the filter, can be controlled independantly, something not possible with some software samplers. Included with Ritmo is a set of free drum kits, including one created by electronic artist Eight Frozen Modules. Ritmo is available for only US$25 or €25. The demo will fade out the sound for a bit every 60 seconds, but is otherwise fully functional. Love of music and desire to have fun. * Either Logic 5.5.1 or Logic 6.1 and above is required for Ritmo to work properly with the Emagic Logic. 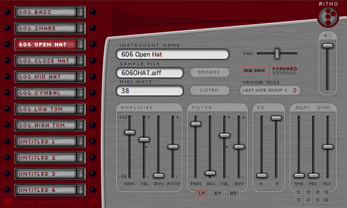 Also, please note that Ritmo will not work with Cubase SX or other VST-only hosts.